Maybe this is a cliché, but the NZXT Phantom Case is ready for liftoff. My first impression out of the box was: “this case looks like a freakin’ space shuttle.” Perhaps it was the smooth white exterior with black mesh highlights or the rounded edge of the drive cover? Now, NZXT may not have had NASA engineers design this monstrous full-tower, but the case is impressive between the cooling possibilities, wire-management features and it’s beautiful exterior. When this huge box appeared on my doorstep, it was clear exactly what was inside. This is no brown box, it is a sleek and gaudy package. The front displays a clear photo of the case, while the back explains the many features of the Phantom. No major dents were found on the box, although there were a few small punctures in the cardboard. Upon opening the package, I was slightly disappointed to find the white version of the case (as opposed to black or red). White cases evoke a feeling of cheap factory-built PC’s from the 1990’s, plus they are harder to photograph. However, my preconceived anti-White bias was shattered as soon as the case was fully removed from the packaging. The design is quite striking with the combination of straight and curved edges on the front and top of the case. 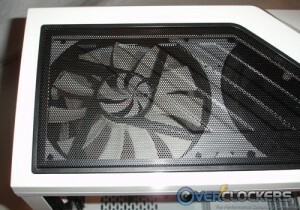 Plus, the mesh fan grills on the top and side panel give the case a chic, futuristic feel. 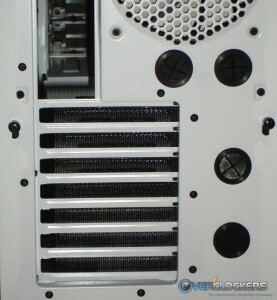 Dual radiator support and quad watercooling tube cutouts on backplate. This case has plenty of mesh to help airflow, plus fan filters help keep the dust out. As mentioned above, the curves and straight edges combine for a futuristic feel. This theme continues when exploring the top of the case as well, with the bright blue power LED, fan controller indicator LEDs and fan LED towards the rear of the case. Taking a closer look, the typical power and reset buttons are present, plus top-mounted USB, audio/mic and E-SATA ports. 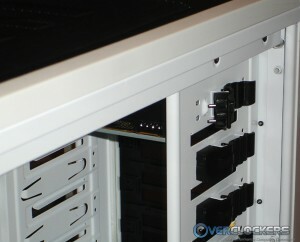 The five channel (20w per channel) fan controller switches are located on the top of the case as well. 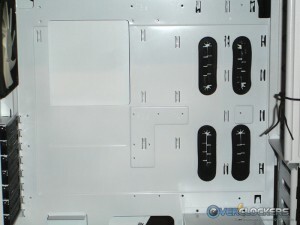 The channels are labeled with diagrams instead of the standard 1, 2,3, 4, 5 numbering system. This is a welcome change because it makes it much easier to keep track of which switch is controlling what fan. No labeling fans or guessing involved. The diagrams illustrate the location of the fan. To make things even easier, NZXT already connected the included four fans to the corresponding channels. Despite my efforts, I was never really able to decipher the speed of the fans when manipulating the switches on the fan controller. I did not have an advanced RPM reading tool, just used my ears to try and listen. There was no discernible difference in sound when the fans were on high or low. Moving to the front of the case, there is a stylish door hiding the 5.25″ bay covers (which are also mesh) and easily removable. The switch located on the right side of the photo below can be toggled from side to side to remove the bay cover. This method is a whole lot easier than reaching inside the case or prying them out with a screwdriver. My only qualm is that the drive bay door does not lock into place, so the door can easily swing open. This is a minor issue since the case is too large to move around on a regular basis. When the case is perfectly still the drive door will not fly open on it’s own, not even with a Delta screamer pushing 200 cfm directly into the door will cause it to open. 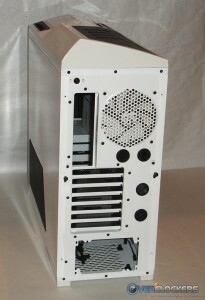 The back of the case is pretty standard with a space for the IO back-plate and PCI/PCI-E cards. Each slot cover is mesh instead of solid aluminum, which again helps air flow freely through the case. Above the IO back-plate is a small black button, which turns the LED in the top-mounted fan on and off. This is a convenient feature if the PC is located in a bedroom. The fan’s bright blue LED can be blinding when trying to sleep. 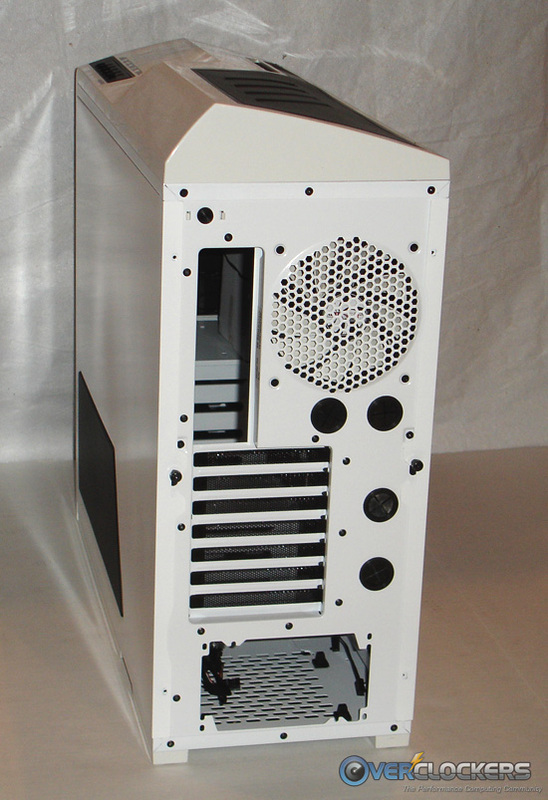 Also, the rear of the case features four watercooling tube cutouts, all .8″ in diameter, which is large enough for most types of standard tubing. The inside of the case on either side is accessible by thumbscrews, making everyday maintenance or upgrades easy and painless. 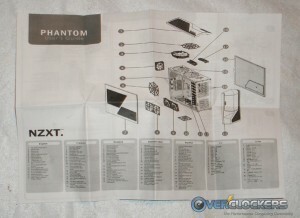 Time to take off those thumbscrews and explore the inside of the Phantom. Depending on cooling and hardware setup, you may want to reconfigure the fans to suit your needs (I did, see Installation below for details). Each fan mount area also contains a fan filter screen in addition to the mesh as an added layer of protection against dust build-up. 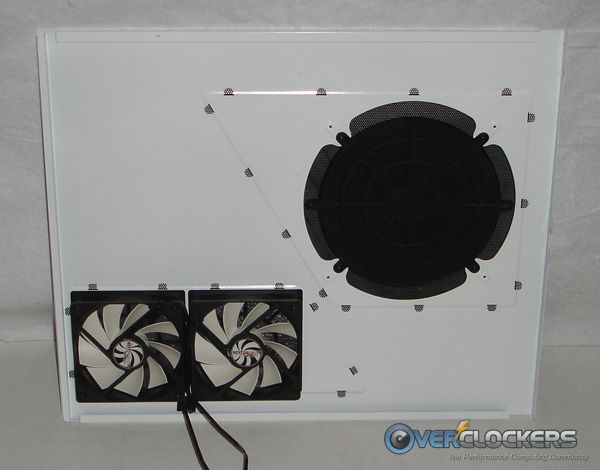 Usually smaller fan filters cost a minimum of $3, so including seven of them (as large as 200 mm) with this case is worth $20 at least, probably more. 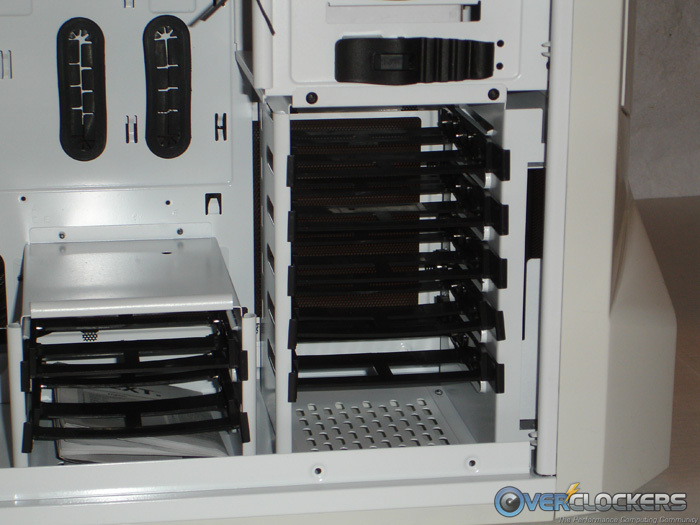 There are five 5.25″ bays and a whopping seven 3.5/2.5″ bays. 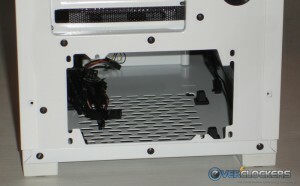 The HDD/SSD bays are hard plastic plates that slide in and out of the case. 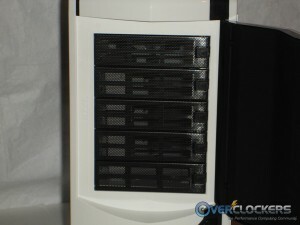 This makes swapping storage easy and definitely makes up for the lack of hot-swappable capabilities on this case. There is quite a bit more to say about the interior of the Phantom, but most of it was uncovered while installing my system. The case ships with a visual diagram of the case components and tons of screws, all clearly labeled to avoid any confusion. The labeling is helpful, as it can be difficult to tell the difference between the small screws. NZXT also threw in some zip ties for wire management and a PC Speaker plug. To sum up, installation went about as smoothly as possible. 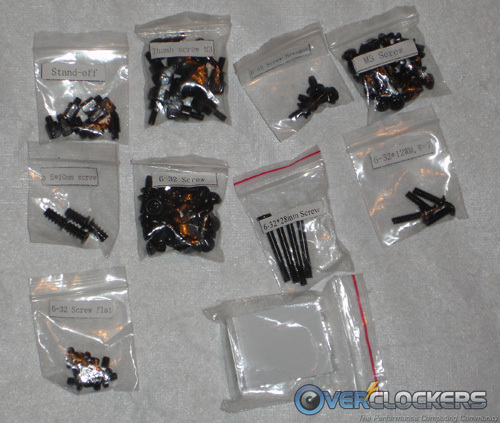 No major problems to report while mounting the motherboard. My setup is pretty typical, the only wrinkle is my cooling, a CoolIt Vantage self-contained watercooler. The cooler includes an attached 120 mm radiator, which means I could not route the tubing through the watercooling holes on the back of the case even if I wanted to. In order to fit the radiator inside the case, the rear 120 mm fan was moved from the back of the case to the front of the case. In a matter of minutes the CoolIt Vantage was snuggly mounted inside the case. 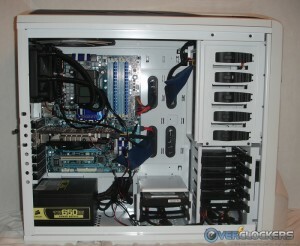 Up next was the power supply, which was located on the bottom, not the top of the case. 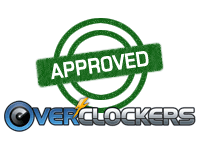 A little bit unusual, especially since air flow to the power supply is a concern when overclocking. To my surprise, NZXT has accounted for that with four small rubber braces that the power supply sits atop when mounted in the case. 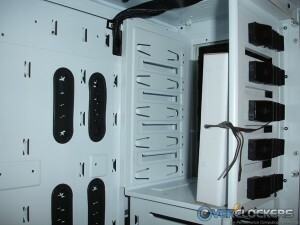 These rubber braces coupled with 2/3 ” of clearance below the case allows for air to flow freely to/from the power supply. This whole process takes about ten seconds, while you can easily spend a couple of minutes when manually screwing drives into place. This is not a major innovation in the computing world, but the little things really do add up when constructing a PC from scratch. The rest of the build went smoothly and was pretty typical. 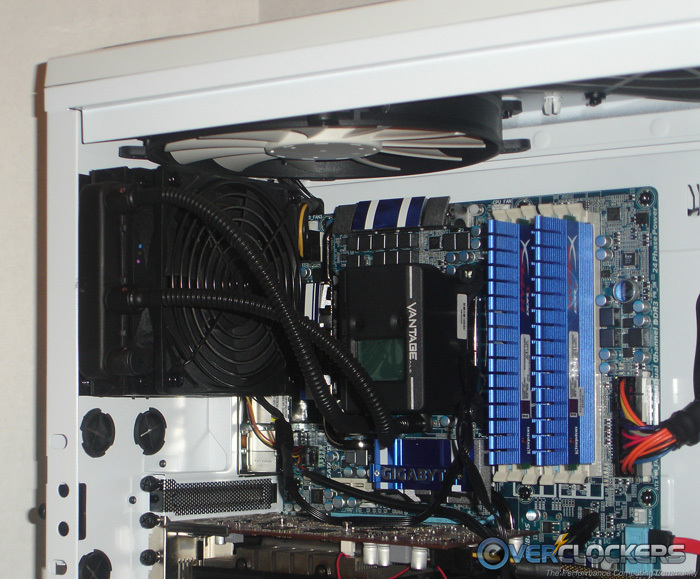 When I was ready to string it all together and wire the rig, I noticed plenty of nooks and crannies to hide wires. Plus, there are four dedicated wire management holes strategically located between the motherboard and 5.25″ bays. 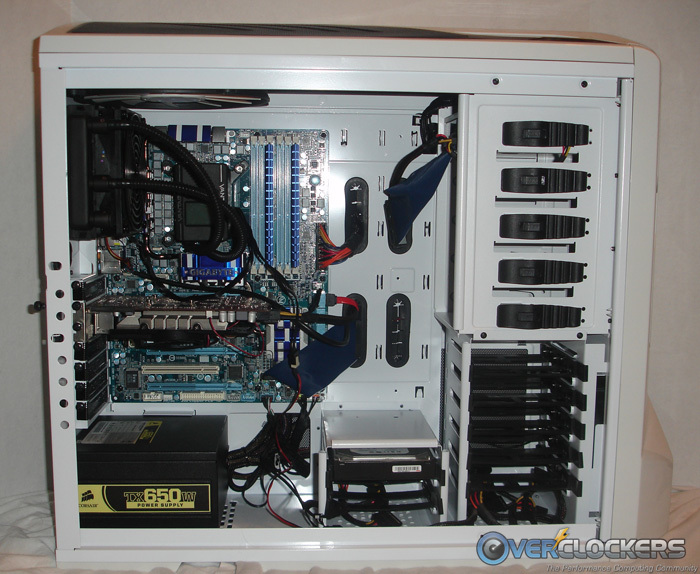 Now wire management is not one of my utmost concerns, but every enthusiast can appreciate a clean looking build. 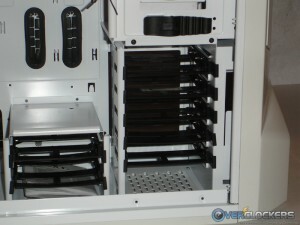 The only downside is that the rubber guard surrounding the wire management holes falls off easily. If you handle with care, it should not be a problem. In order to get the side panel on behind the motherboard tray, I had to rearrange the wires slightly using the included zip ties. 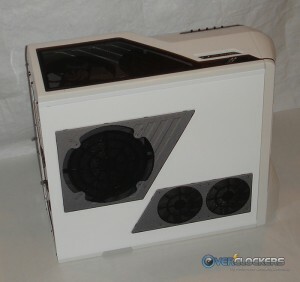 Ultimately, I am not a huge case fanatic, however I was really impressed with this case. 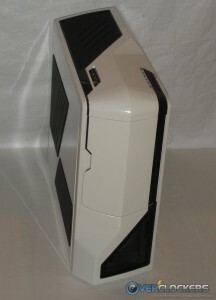 For $139.99 at Newegg, this case is a steal. There was almost nothing negative to say about this product, mind you it is my job to look at these products critically. 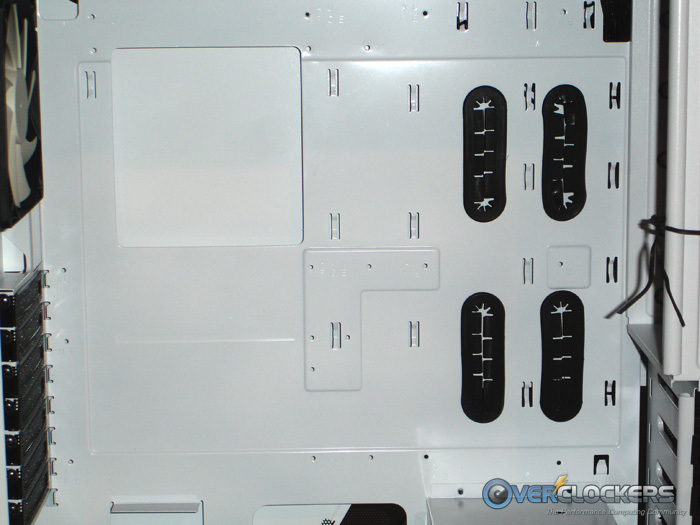 Installation was smooth, especially with screwless 5.25″ bays and thumbscrews in the expansion slots. 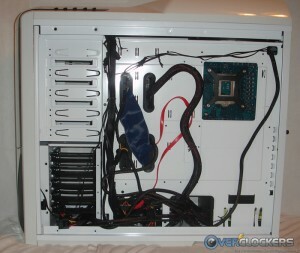 It was also great not to have to wire up my own fan controller setup, the Phantom was already wired and ready for use. 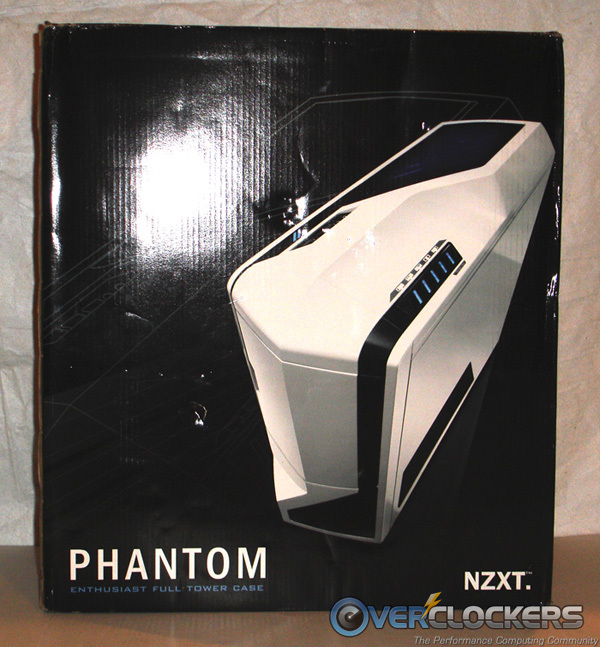 If you are in the market for a new case, the NZXT Phantom will not disappoint. 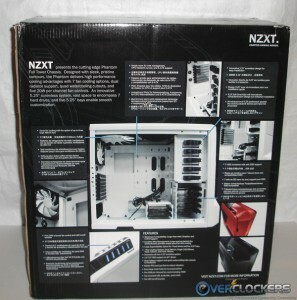 Thanks to NZXT for supplying this unit for review. Yeah, the white initially turned me off, but I started to really like it after a while. I was never a fan of white because it always felt cheap, like a 1998 Gateway PC or something, but this white is really stylish. 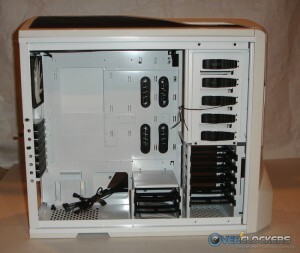 Looks good, I heard of that case but I didn't know it was full tower. How solid does the plastic construction feel in comparison to steel cases? The case is steel. The front and top of the case have a plastic outer casing around it. The plastic is really thick and sturdy though. Overall, it's really solid material, not that flimsy metal that some cases are built with. A Storm Trooper! Thats what it reminds me of...I thought it was the space shuttle, but nope. So it is steel. I've been in the market for a new case, I suppose this is the one for me! does that make it "The Phantom Menace" case?
" nice is case, to have feature and fuctions" Yoda. I like it. I have a white themed case and its one of my best. i actualy have one of theese cases on order (should be here next week or so). i love the built in fan controler, and the spacious interior. I enjoy working in my Phantom. Really. Enjoy. After years of struggling with beige boxes or too-small after-all cases, and six months of reading reviews, going to Fry's for some touchy-feely on all my other choices for a main rig, I bought a Phantom on sale at $99.00 + tax = $107.00. And am really glad I did. The door on front, well, I've got curious young grandkids. Nice to have the door to hide all the potential for tiny button pushers. Built a caddy to roll it around under my return/desk. Cable management? Let's just say "way too easy". You can quote me on that. Got some sleeved NZXT extensions. Smudges on the plastic shell? Well, a little dab of Armor-all on a washcloth takes care of that. A chamoise afterwards takes care of later wipedowns. Storm Trooper look? Not for everyone, that's for sure. But then, I went to the opening of Star Wars in 1977 with some friends. So the look is definitely not a problem for me. And after adding a couple of more fans I have a very quiet but cool computer. 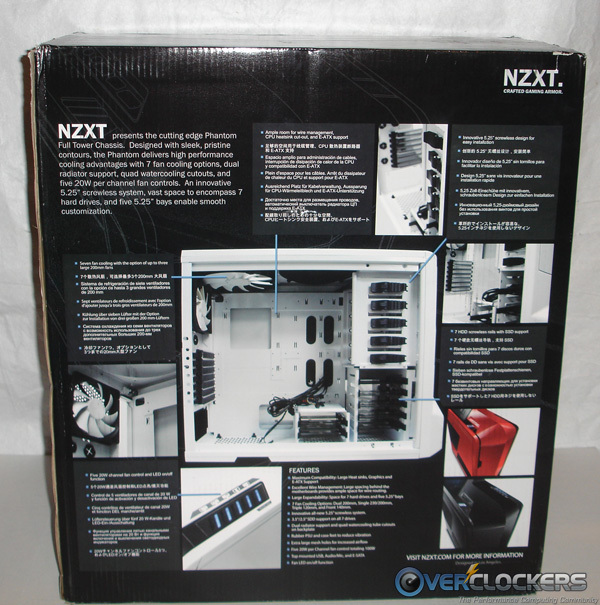 I say, good job on the box NZXT. I just got my NZXT Phantom Black too and loving the design, only problem is with the Corsair H80 cpu cooler you cant fit a 200mm fan on the side door as it hits the radiator. Other than that the case is sweet. 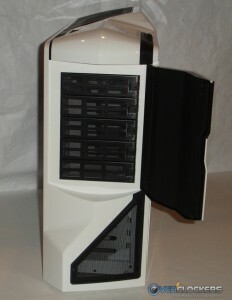 I think the black phantom will be the case I go with when I build my wife a new system. I definitely look forward to using this case.